I departed early Thursday morning on November 4th from Washington, DC. In the morning, we drove into the mountains of Honduras. By the time we passed La Esperanza and arrived in Pinares, we had crossed the river where an adjacent bridge collapsed, wound through the mountains where rock slides had partially blocked roads, and ultimately arrived at a rural mountainside "comedor," which was where we would stay. The clinic was a short walk up the road and directly visible from the comedor. That evening we discussed our schedule for the following day and unpacked supplies to get ready. On Saturday, part of the group would manage the clinic while the rest would go to a nearby school (about a 20 minute walk) for the Child Health Initiative. The Child Health Initiative was designed for children to go from one station to the next and have several aspects of their health measured, such as height, weight, hemoglobin levels, vision, and dental hygiene. Each child was also evaluated by a physician, and this was my task on Saturday. I reviewed the measurements and examined the children, and then made recommendations for vitamins, supplements, and/or medications as needed. In addition, every child had dental varnish applied, was educated on dental hygiene, and given a toothbrush to apply their newfound knowledge. On Monday, the Child Health Initiative was in another village, this time requiring a three hour hike to get there. This time I managed another station, primarily weighing and measuring children. At the end of the day, a few of us played soccer with the children in front of the school. The evening was spent organizing data from the day, preparing for the next day with supplies, and reading or playing card games before sleeping. On Tuesday I worked in the clinic with another physician and students. 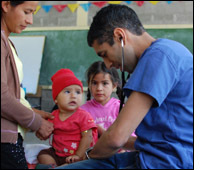 Seeing patients here was similar to a typical office setting, albeit with fewer resources than in the United States, though the people of Honduras were grateful for what was available. It was memorable to see such patients, and I enjoyed working with the students who were eager to learn both medicine and the culture of our patients. Four of us departed the next morning for San Pedro Sula. The drive was a reverse playback of the journey to Pinares a week before, which is still a vivid memory. As the plane took off, and the mountains grew smaller beneath its wing, I thanked Honduras for the memories and hoped I would someday return.